Did you know state law (A.R.S. 43-1089.01) allows you to take a tax credit when you donate up to $200 for single filers and $400 for married filers to a public school for extracurricular activities that require an enrolled student to pay a fee? This means taxpayers may help Cocopah Middle School and reduce their state tax bill at the same time. Tax credit monies may be used to provide an academic boost with extra-curricular activities including: Character Education, Fine Arts for Percussion, Jazz, Orchestra, Band, and Choir, Before and After-School Programs, Field Trips. In previous years your Cocopah tax credits have provided: mentoring for Band/ Choir/Percussion/Orchestra, Disney Music field trip, Homework Haven, Club Now, Tutors, Open Computer Lab, Art Club, Library Equipment, and more. Who can take advantage of this opportunity? Everyone who pays Arizona State income tax can donate. Already made a contribution to Cocopah? Share this flyer with relatives, friends and neighbors. They can benefit, and Cocopah can benefit. It’s a win-win! How can I help Cocopah? 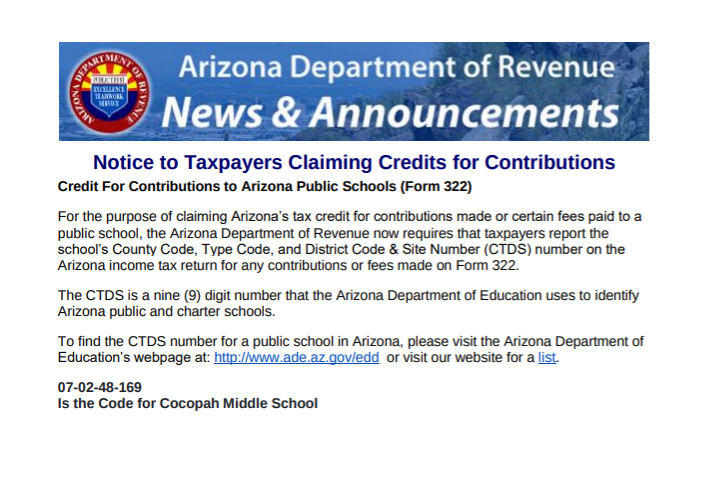 Write a check to Cocopah Middle School, put “Tax Credit” in the subject line. Donations must be received by April 15. Please include your phone number on your check. Cocopah will issue a tax credit receipt to you. Claim the tax credit when filing your Arizona State Income Tax. Tax credits are not refundable by Scottsdale Unified School District.